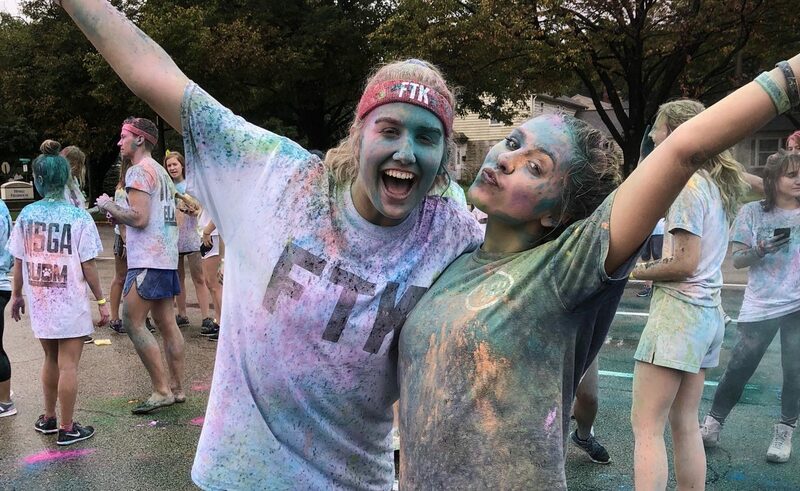 Two Butler students participate in FTKolor Wars. Photo by Henry Weinberg. Despite Saturday’s dreary weather conditions, the Butler University Dance Marathon hosted their first FTKolor Wars. The event, originally intended to feature several field games on the Atherton Mall, was forced to relocate into the HRC. Despite being mostly indoors, the main color war took place outside. To participate in the FTKolor Wars, participants had to donate $10 that went to Riley Children’s Hospital. Additionally, the first 100 to sign up received free FTK t-shirts. BUDM is in their 17th year as a club on campus and helps to fundraise and bring awareness to Riley’s Hospital for Children. Emily Nettesheim is the BUDM president and a senior health sciences and Spanish major. She said that despite the weather conditions, the event was still a success. Saturday’s event featured a week-long buildup that began on Sept. 4 with a Chipotle giveback. Greek organizations also painted banners on campus and had kids from Riley’s Hospital for Children pick their favorite banner. Kappa Alpha Theta won the banner painting event. Lastly, on Thursday a banner at Starbucks with various people’s handprints spelling out FTK, which stands for For The Kids, was on display. “We really wanted to get BUDM’s name out across the campus, to get first years interested in the event,” Nettesheim said. The club is most well-known for its annual dance marathon, where numerous students come together to raise money for Riley. Additionally, BUDM coordinates several other events throughout the year to help fundraise for the hospital. BUDM is just one of numerous dance marathon chapters in high schools and colleges across the state of Indiana. Madeline Murray, a junior communication sciences and disorders major, participated in the club in both high school and college. For Murray, Saturday’s event was one in which college students could enjoy fun childhood games while also supporting a cause. “I feel like it was something that a lot of college students probably enjoyed because it took the stress out of your day and you got to be a kid for a couple hours,” Murray said. Sophomore marketing major Kelly Kingston is another member of BUDM who was active in a Riley Dance Marathon club in her high school. For Kingston, being an active member of the club is important, as Riley Hospital for Children has had a personal impact on her. BUDM’s next event, Night of Hope, is scheduled for Oct. 4. For more information about BUDM, students can access the organization’s new website at www.budm.org.